India’s winter season is not only warm this time but also considerably dry. Rainfall departure in this year till January 13 has been 69 per cent. Twenty out of 36 meteorological subdivisions haven’t received any rain whereas 10 have received scanty rain, three have received deficient rain, two have received normal rain and just one subdivision (of Assam and Meghalaya) has received excess rain. 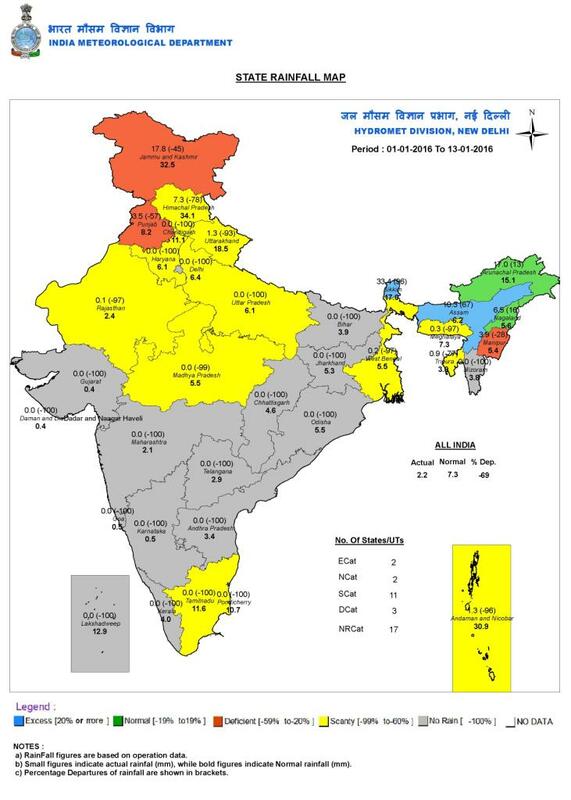 States like Kerala, Karnataka, Andhra Pradesh, Telangana, Maharashtra, Gujarat, Chhattisgarh, Odisha, Jharkhand, Bihar and Haryana haven't received any rain in this year. Union territories like Chandigarh and Delhi also haven’t received any rain. Madhya Pradesh, Rajasthan and West Bengal have received very very little rain. The main source of winter rain in these states (excluding that of South India) is a western disturbance (or an upper air trough). The location and amount of rainfall in the plains depend on the location and strength of these western disturbances. If they strike Jammu and Kashmir and are weak, then this will produce a localised effect i.e North and Central India's plains won’t get any significant impact. But if they strike in lower latitudes and are strong, then the plains receive widespread impact in terms of rain and cloud cover. As till date, we have been witnessing sluggish western disturbances, it was being doubted whether India will receive any widespread rain event in this winter. This rain is very beneficial for winter crops (provided it occurs at the right time). So after a long waiting period, many states of India will witness the first rainfall of this year starting from Sunday, January 17 2016 till Friday, January 22, 2016. An upper air trough (elongated low pressure in upper air winds) is all set to arrive over India by January 18, 2016. As a result of this, a low pressure will form around North Central India in the lower levels of troposphere by January 18 (see above image). Due to favourable atmospheric conditions, moist winds from the Arabian Sea will travel to this area and create a stage for some thunderstorms and rain. Below is day wise forecast. There will be a possibility of light rain in south-eastern parts of Madhya Pradesh, adjoining parts of Chhattisgarh (North Chhattisgarh) and northern parts of Vidarbha in Maharashtra. Thunderstorms with rain are expected in central and eastern parts of Madhya Pradesh (including cities like Indore, Bhopal and Jabalpur), central and northern Chhattisgarh and possibly some western parts of Jharkhand. As a result of cloudy weather and rain, temperatures will decrease in eastern Madhya Pradesh possibly leading to cold day conditions. Thunderstorms/rains become more widespread and are expected to cover northern Madhya Pradesh, more areas of Chhattisgarh, eastern Uttar Pradesh (places like Allahabad, Varanasi), southern Bihar and Jharkhand. Temperatures are expected to fall in these areas due to rain and cloud. Some rain is also possible in parts of Telangana and parts of Rajasthan bordering northern Madhya Pradesh. As the trough shifts eastwards, the associated rain belt will also shift eastwards. Rain expected in parts of Chhattisgarh, Bihar, Jharkhand, West Bengal, Odisha and eastern Uttar Pradesh. From Thursday, January 21 onwards, the weather will start normalising but as near surface winds will turn northerly, there will likely be a considerable drop in minimum temperatures in central India particularly Madhya Pradesh. This rain will help the winter crops where they are in growth stage and moisture stressed. But thunderstorms and associated rain/wind can damage horticulture (fruits and vegetables).